BSH Home Appliances Corp is recalling Thermador Brand built-in double ovens with model numbers C272B, C302B, SEC272, SEC302, SECD272 and SECD302 and serial numbers between FD8403 through FD8701. This recall affects about 37,000 units sold between June 2004 and July 2007. Gaps in the insulation may cause over-heating during the self-clean cycle cause neighboring cabinets to catch fire. Consumers with a recalled oven should stop using the self-clean and contact Thermador at (800) 701-5230 to schedule an inspection and repair at no cost. Model and serial numbers are located on the underside of the control panel. 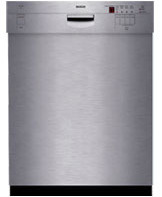 BSH Home Appliance Corp. has recalled almost 476,500 Bosch and Siemens dishwashers due to a fire hazard. 30 fires have been reported from an electrical component overheating. The models in the recall were sold between May 1999 and December 2006. To find your model and serial number look on the side of the door. If you have one of the models listed, stop using it immediately and call 1-800-856-9226 to schedule your free repair.